A brief history of the countries that send people to space, and why. 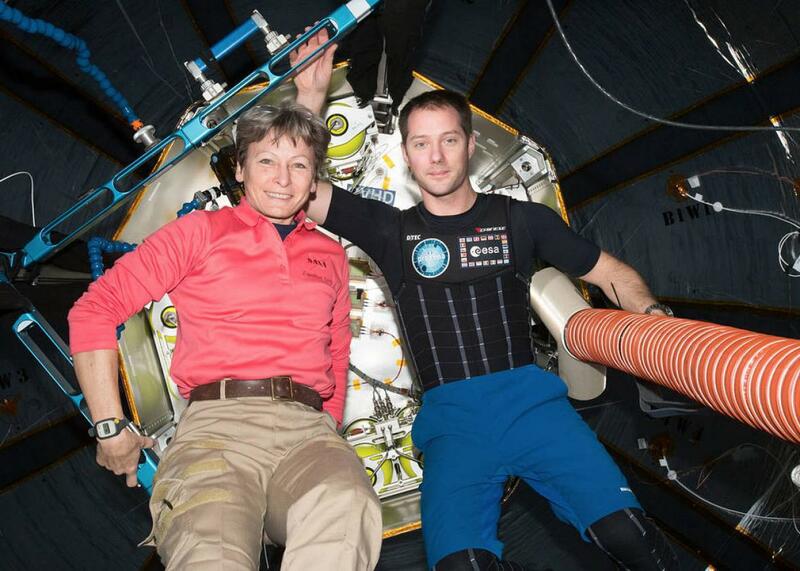 Astronauts Peggy Whitson, an American, and Thomas Pesquet, of France, pictured inside the Bigelow Expandable Activity Module on the International Space Station. Advocates for human spaceflight often make the claim that space travel fundamentally reshapes terrestrial politics. Seeing Earth from above results in a realization of the artificial nature of political boundaries and the fragility of human existence, and cooperation in space, as with the International Space Station, a joint American, Russian, European, Japanese, and Canadian endeavor, leads to harmonious international relations on Earth. But human travel in space has been a consequence of politics and commerce on Earth, not the other way around. For the first 17 years of human spaceflight, only Americans and Soviets went to space. In the 1970s, as Brian Harvey writes in his book Europe’s Space Programme, the United States made an agreement with France, West Germany, and other Western European countries to help pay for the space shuttle program, because Richard Nixon wanted to cut NASA’s budget. The Europeans would get to send astronauts into space as part of the deal. In response, the Soviet Union decided to beat the Americans to it, seeing a chance for a propaganda victory, as Colin Burgess and Bert Vis recount in their book Interkosmos: The Eastern Bloc’s Early Space Program. The Russians simply found fighter pilots from allied countries and trained them to fly on the Soyuz. Vladimir Remek, from Czechoslovakia, came first, in March 1978, with his Polish and East German counterparts following later that year. Bulgaria took its turn in 1979 and Hungary in 1980. Pham Tuan, of Vietnam, became the first (non-Soviet) Asian to go to space that year, and Arnaldo Tamayo Méndez, from Cuba, became the first person of African descent. (Ed Dwight, who might have been the first black American astronaut, resigned in the face of discrimination after John F. Kennedy was assassinated.) Mongolia came next in 1981, followed by Romania. Jean-Loup Chrétien, the first Frenchman in space, got there in 1982—on a Russian rocket, to his surprise. He had expected to go with NASA, but after West Germany got priority on the shuttle, the French government turned to the USSR. The collaboration was announced with fanfare, but by the time Chretien got to space, the French government had changed, and the Soviet Union had invaded Afghanistan, so when he got back home after his spaceflight, “there was absolutely no official welcome back … [t]hey had told the press that we are not coming that day. So we arrived like tourists, and the only people welcoming us at the airport in Paris when coming back were the people from the Soviet embassy.” Chrétien would later become the first person other than an American or Soviet to go on a spacewalk, and would also fly on the space shuttle. Throughout the 1980s and ’90s, France would continue to send spationautes to orbit on both American and Russian rockets. Other Western European countries would follow suit; Ulf Merbold, the West German who beat Chrétien to be the first non-American on the space shuttle, would reverse his path by flying on Soyuz in 1994. Like Merbold, a solid-state physicist by training, most of the foreigners who flew on the space shuttle were scientists or engineers. Canada, the Netherlands, Belgium, Italy, Switzerland, Spain, and Sweden all sent their first citizens to space this way. After Ulf Merbold’s first trip, Germany paid $65 million to charter the space shuttle Challenger (on what would be its last successful flight) in 1985. “Biggest Shuttle Crew Begins First Foreign-Run Mission,” the New York Times headline read. The launch time was shifted to noon so that it could be carried at a good time for German TV, and a new mission control center in Oberpfaffenhofen, southwest of Munich, controlled the scientific parts of the mission. Meanwhile, the Soviets took Indian, Syrian, and Afghan fighter pilots to space for the propaganda value. Rakesh Sharma, the Indian, did yoga in space for the first time, called Prime Minister Indira Gandhi from space, and took pictures of India, according to Burgess and Vis. Syria’s first and only cosmonaut, Muhammed Faris, became a general in the Syrian Air Force after a brief trip to space in 1987. He now lives as a refugee in Istanbul. Abdul Ahad Mohmand traveled to space atop a Soyuz rocket in 1988, becoming the first Afghan in space just as the Soviet presence in his country was unwinding. After returning to Earth, and to Afghanistan, he fled to Germany as a refugee, subsisting on public assistance for a short time before getting jobs in a print shop and as an accountant. Struggling through the first of his nightly live broadcasts from the heavens, Mr. Akiyama spent a lot of time describing the uglier details of space sickness. A chain smoker, he repeatedly longed for a cigarette. His brain, he complained, felt as if it was “floating around in my head.” Told to pack light, he failed to bring along enough underwear. While Akiyama was training for his spaceflight, Helen Sharman of the United Kingdom heard an advertisement on her car radio: “Astronaut wanted. No experience necessary.” She was the winning candidate of the 13,000 people who applied. Her trip was to be paid for by “Project Juno,” a combination of corporate sponsorships and the proceeds from television rights—a sort of proto–reality TV show. The organizers of Juno couldn’t raise enough money, and the project fell apart while she was training outside of Moscow. As a goodwill gesture, Mikhail Gorbachev decided to send her to space at Soviet government expense. She spent a week on the space station Mir in May 1991, just before Gorbachev fell to a coup d’état and the Soviet Union fell apart, the last time a foreigner flew on a Soyuz for free. She returned to Earth from Mir on a Soyuz that had brought up Franz Viehböck, the first “austronaut”—the Austrian government paid the Russians a bit more than $8 million for his ticket. Chrétien’s 1982 Soyuz flight was perhaps the first in which a trip to space was sold as if through a travel agency. As the American and Soviet space programs stumbled through budget crises, both sold seats while trying to maintain that they were serving a higher scientific purpose. Rodolfo Neri Vela, the first and only Mexican astronaut, rode on the space shuttle Atlantis in 1985, as part of an arrangement that Henry Hartsfield, who commanded two space shuttle flights, described as “payola. It was marketing. ‘You put your payload on our Shuttle and if it’s more than 50 percent of the payload bay, you can fly a person of your choice.’ ” Brewster Shaw, the commander of Neri Vela’s mission, didn’t trust him. The space shuttle had a hatch that could be opened, releasing all the air onboard out into space. “We didn’t know Rodolfo very well,” Shaw recalled. “So I padlocked the hatch shut right after we got on orbit, and I didn’t take the padlock off until we were in de-orbit prep. I don’t know if I was supposed to do that or not, but that’s a decision I made as being responsible for my crew and I just did it.” Neri Vela was one of two outsiders on that flight, along with Charlie Walker, whose company, McDonnell Douglas, paid NASA $20 million for a number of flights on the shuttle. Jerry Ross, a NASA astronaut on that flight, said of Walker and Neri Vela: “They were always very helpful. They knew that if the operations on the flight deck were very hectic, they stayed out of the way.” Neri Vela is remembered by astronauts primarily for introducing flour tortillas to space in 1985, in what Walker described as “something of a minor revolution in the U.S. Manned Space Program.” Tortillas didn’t get as stale and, crucially, didn’t create crumbs like the sandwich bread they replaced. There have long been disputes over how to characterize the private citizens and nonexperts who went to space. Astronaut and cosmonaut are odd words. A Russian flying an airplane is a pilot, and so is an American—we don’t use different words for two people doing the same thing just because of their nationality. No one thinks that sitting in the window seat of a Virgin Atlantic 747 makes you a pilot. But if you are paying Richard Branson $250,000 to spend three minutes or so weightless, at the edge of space, astronaut has a better ring to it than participant. Such discussions took place regarding Christa McAuliffe, who was to have been the first teacher in space. She died with six others in 1986 in the Challenger explosion. Walker later recalled in a NASA oral history, “I witnessed a lot of slicing and dicing of just what do you call Christa McAuliffe. Is she an astronaut? Well, most people at the time at JSC and certainly in the Astronaut Office were, ‘No, she is not an astronaut. We were selected by NASA to be astronauts. We’re the astronauts.’ ” For the most part, she was referred to as a “spaceflight participant” before her death, and as an astronaut afterward. After the Challenger disaster, NASA stopped flying outsiders for a period. It revived the term spaceflight participant as a sort of calculated bureaucratic putdown of Dennis Tito, an American millionaire who paid the Russians to fly him to the ISS in 2001and who is often misidentified as the first space tourist. NASA leadership, which got into disputes with Tito in the press, wanted to accentuate Tito’s dilettantism. NASA dubbed Sen. Garn and Rep. Nelson “payload specialists,” though they had no payload and weren’t specialists. But Tito was nothing more than a passive participant, in NASA’s eyes. So too the next guy the Russians took up, Mark Shuttleworth, who in 2002 became the first South African to go to space. Shuttleworth was followed in “spaceflight participation” in 2006 by Anousheh Ansari, arguably the first Iranian (she is also a U.S. citizen) and in 2008 by So-yeon Yi the first Korean. Russia’s merchandizing of its space program sometimes took a convoluted form. Back in 2003, Malaysia bought 18 Sukhoi fighter jets from Russia for almost $1 billion. As part of the deal, Russia promised to take a Malaysian up to the ISS. Because the ISS is jointly operated by the Russians and Americans, NASA has a stake in what happens there, too, and it caused some trouble in this case. When Sheikh Muszaphar Shukor became the first Malaysian to go to space in 2007, Malaysians scrutinized the nomenclature of NASA officials who went back and forth between calling him a spaceflight participant and an astronaut. (As with Prince Sultan, Sheikh is a name here, not a title.) When Shukor was headed for space in 2007, AFP reported: “NASA astronaut Robert Gibson helped restore national pride by insisting [Shukor] was a fully fledged astronaut, or ‘angkasawan’ in the Malay language.” The Malaysians emphasized that Shukor performed a series of scientific experiments on the ISS. His experiments included seeing whether Malaysian food tasted different in space, taking a video of a toy, and reporting whether he got dizzy or felt back pain. [T]he whole earth is of such colours, indeed of colours far brighter still and purer…one portion is purple, marvellous for its beauty, another is golden, and all that is white is whiter than chalk or snow; and the earth is composed of the other colours likewise, indeed of colours more numerous and beautiful than any we have seen. Plato’s vision of beauty did not stop the past two and a half millennia of politics from transpiring. As Pulitzer prize–winning historian Walter McDougall wrote in Remembering the Space Age, a NASA-commissioned retrospective, “politics and economics—both foreign and domestic—have always dictated the scale and trajectory of space programs, rather than a revolutionary technology transforming politics and economics.” International collaborations in space have resulted from politics, rather than changing them. This was true when the Soviets sent Jügderdemidiin Gürragchaa up in a Soyuz in 1981, making him the first Mongolian to go to space. It was still true in 2015, when Andreas Mogensen made Denmark the newest member of the space club. This article is part of the new space race installment of Futurography, a series in which Future Tense introduces readers to the technologies that will define tomorrow. Each month, we’ll choose a new technology and break it down. Future Tense is a collaboration among Arizona State University, New America, and Slate.